There are two kinds of people: those who like cakey brownies and those who like fudgey brownies. If you like fudgey brownies, these are the brownies for you. If you’re like me and prefer cakey brownies, make this recipe instead. I suppose the one good thing about not liking fudgey brownies is that I won’t be tempted to eat them at the office tomorrow. 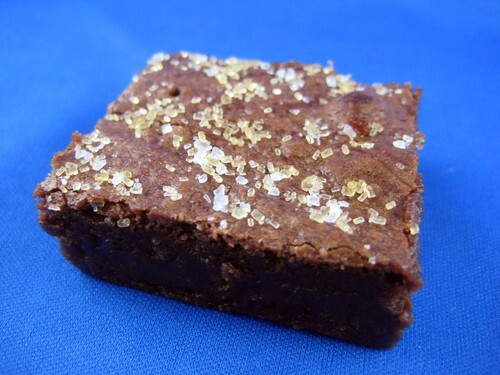 Anyway, if the recipe looks familiar, it’s because it’s basically the original Baked Brownie, minus the espresso powder, with an added middle layer of salted caramel, and topped with fleur de sel and coarse sugar. I’m kind of sad I didn’t like this more. I feel the need to add that these brownies were an enormous hit at my office, and I received more than one email begging me to “TAKE THE BROWNIES AWAY” because they are so good. Like I said, some people are fudgey, some people are cakey. Less calories for me! In a medium saucepan, combine the sugar and corn syrup with 1/4 cup water, stirring them together carefully so you don’t splash the sides of the pan. Cook over high heat until an instant-read thermometer reads 350 degrees F, or until the mixture is amber in color, 5-7 minutes. Remove from the heat, slowly add the cream and then the fleur de sel. Whisk in the sour cream. Set aside to cool. Butter the sides and bottom of a glass 9 x 13 inch pan. Line the bottom with a sheet of parchment paper and butter the parchment. In a medium bowl, whisk together the flour, salt, and cocoa powder. Place the chocolate and butter in the bowl of a double boiler set over a pan of simmering water and stir occasionally until the chocolate and butter are completely melted and combined. Turn off the heat, but keep the bowl over the water of the double boiler, and add both the sugar. Whisk until completely combined and remove the bowl from the pain. The mixture should be at room temperature. Add three eggs to the chocolate mixture and whisk until just combined. Add the remaining eggs and whisk until just combined. Add the vanilla and stir until combined. Do not overbeat the batter at this stage or your brownies will be cakey. Sprinkle the flour mixture over the chocolate. Using a spatula, fold the dry ingredients into the wet ingredients until there is just a trace amount of the flour mixture visible. Pour half of the brownie mixture into the pan and smooth the top with a spatula. Drizzle about 3/4 cup of the caramel sauce over the brownie layer in a zigzag pattern. (There will be sauce leftover. I may or may not have eaten it with a spoon.) Use an offset spatula to spread the caramel evenly across the brownie layer. In heaping spoonfuls, scoop the rest of the brownie batter over the caramel layer. Smooth the brownie batter gently to cover the caramel layer. Bake the brownies for 30 minutes, rotating the pan halfway through the baking time and check to make sure they are done by sticking a toothpick into the center of the pan. The brownies are done when a few moist crumbs are stuck to the toothpick. Remove the brownies from the oven and immediately sprinkle the fleur de sel and coarse sugar over the top. Cool the brownies completely before cutting and serving. The brownies can be stored, tightly wrapped at room temperature, for up to 4 days. Recipe adapted from Baked Expectations via If You Give a Girl a Cookie. yum i love everything i’ve made from their first cookbook. love the sweet salty combination too! I’m with team fudgy! and top that with salted caramel. this is sounding like a dream dessert! thanks for sharing! Is it possible that I can be both a cake brownie and a fudge brownie lover? I made the Baked brownies for the first time recently and I loved them! Your version sounds extra amazing with the salted caramel. It was great to meet you at Foodbuzz fest this weekend! I have the book so I have no excuse for not making these. How did you get the straight edge on the brownie? Mine is always ragged.